Your Domain Name Is Your Online Business Identity – Who Owns Your Name? Will the Quest for Woody Biomass Really Set Off an International Land Grab? In September, Agriculture Secretary Tom Vilsack announced five major agricultural research projects that would be aimed at developing regional renewable energy markets, generating rural jobs, and decreasing America’s dependence on foreign oil. Altogether, the five-year program will deliver more than $136 million in research and development grants to public and private sector partners in 22 states. Vilsack made the announcement with partners from private industry, research institutions, and the biofuels industry at the Seattle-Tacoma International Airport. A research team from the University of Washington received $40 million to focus on using sustainably grown woody energy crops to produce biogasoline and renewable aviation fuel. A consortium of eight organizations will work throughout the entire woody biomass supply chain to promote the financing, construction, and operation of multiple biorefineries, while reaching out to landowners and land managers, as well as regional students, to foster workforce development opportunities across the supply chain. A research team led by Washington State University received $40 million to convert closed timber mills into bioenergy development centers, improving the economic potential of rural communities affected by the downturn in timber production. The team will focus on feedstock development, sustainable forest production and establishing new methods to identify the most promising plant lines for biofuel conversion. The project aims to develop a regional source of renewable aviation fuel for Seattle-Tacoma International Airport. Rex Storm, Forest Policy Manager for the AOL reported that Oregon Governor John Kitzhaber announced that the State of Oregon will ask the U.S. Supreme Court to review a flawed 2010 ruling by the 9th U.S. Circuit Court of Appeals, which had declared that forestry water runoff must be treated the same as factory and sewer runoff. Agriculture Secretary Tom Vilsack announced that the findings of a new U.S.F.S. study indicate that wood should factor as a primary building material in green building. The Forest Service report also points out that greater use of life cycle analysis in building codes and standards would benefit the environment. A combination of scientific advancement in the areas of life cycle analysis and the development of new technologies for improved and extended wood utilization are needed to continue to advance wood as a green construction material. Sustainability of forest products can be verified using any credible third-party rating system, such as Sustainable Forestry Initiative, Forest Stewardship Council, or American Tree Farm System certification. 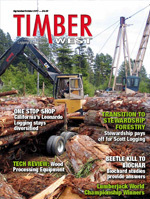 The Oregon timber industry took a hit in September when. U.S. Magistrate Judge James Hubel recommended that the Bush administration plan to double logging on some federal lands in western Oregon should be vacated. Hubel stated that the BLM had failed to properly consult federal biologists over the potential harm to endangered species before adopting the Western Oregon Plan Revision, known as the WOPR. If a federal judge approves Hubel’s recommendations, the Bush-era plan will be replaced by the Northwest Forest Plan, which was adopted in 1994. In August, Hampton Affiliates reopened its Warrenton sawmill, after closing and upgrading the mill it purchased in January 2010 from the Weyerhaeuser Co.
Rex Storm, Forest Policy Manager for ALC, reported that, “Hampton invested millions to make the mill competitive and produce a variety of dry or green fir and hemlock dimensional lumber for export and domestic markets. The mill opened with a single 100-employee shift and intends to add a 2nd shift when domestic markets improve. Portland-based Hampton employs 1,600 in Oregon, Washington, and BC, with nine sawmills and 93,000 acres of forests.